In preparation for my Castle Grayskullman review, I conducted a brief interview with CGM creator Daniel Benedict. Be sure to check out Daniel’s “ad” for CGM. Poe Ghostal: How did you come up with the concept for Castle Grayskullman? Daniel Benedict: I was sitting at my desk trying to come up with another character design to send in. I had already sent in three, but I still racking my brain trying to, if anything, scrape the bottom of the barrel and send in a stick figure with a sword if I had to. I had the vintage castle on my desk and was looking at it. I thought it would be neat to make the castle into a head. And I went from there. Why did you go with each specific part (chest symbol, swords, face, hair)? I wanted to incorporate parts from the vintage playset (chest symbol, swords, etc.) I added the hair, because it looked to boring without it. I think it adds character, and a little 80’s to it. Did you enter any other submissions? I entered 5 total. CGM was number 4. Did Mattel inform you before the reveal that you’d won? No, I found out that morning when the info had been leaked. I almost crapped my pants. Did Mattel or the Four Horsemen consult with you on the development process at all? Are you happy with the final product? Happier than the double rainbow guy. Even if you are happy, is there anything you’d have done differently on the final figure, in an ideal world? Maybe lighten up the green a bit, make the hair more white. 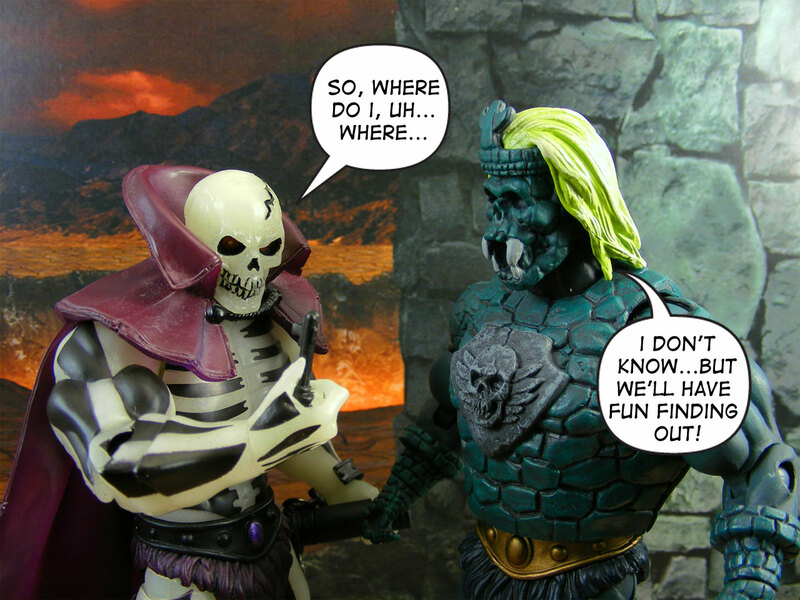 Would a 1980s “vintage” Castle Grayskullman have had an action feature, and if so, what? What about having a button on his back to make his eyes light up? That would’ve been pretty cool..
How many CGM did you get? 24 plus one with my subscription. props to daniel for his videos, they made being a CGM fan extraordinarily easy and enjoyable.